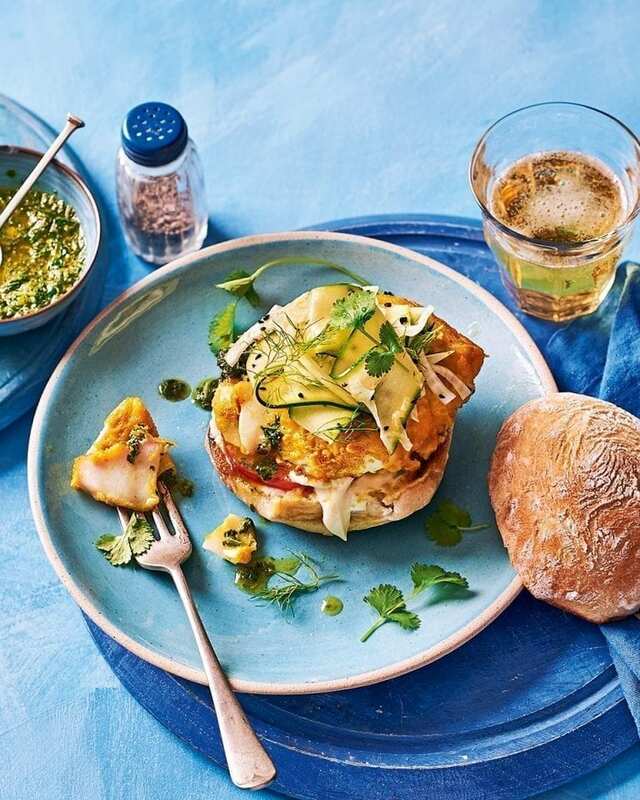 Whoever said burgers are heavy and greasy has never tried these fresh, cod burgers seasoned with turmeric. Serve with a generous dollop of coriander chutney and the homemade pickle for the ultimate barbecue recipe. For the coriander chutney, whizz all the ingredients with a pinch of salt and some freshly ground black pepper in a food processor or mini chopper. Set aside. Mix the flour, turmeric, lemon zest and chilli flakes on a large plate and season well with salt and pepper. Coat each piece of fish in the seasoned flour and set aside until ready to cook. Up to an hour before serving, mix all the pickle ingredients together in a bowl. To serve, spread the mayonnaise on the toasted ciabatta roll bottoms, then add a slice of tomato and top with a fish fillet. Spoon over the chutney and top with the courgette and fennel pickle, and the reserved fennel fronds and coriander leaves. Add the ciabatta roll tops to serve. Next time swap the white fish for fresh mackerel fillets; cook as in the recipe. Make the chutney the day before and keep covered in the fridge. Coat the fish (step 2) and make the pickle up to an hour ahead (store the fish in the fridge, covered, until ready to cook).